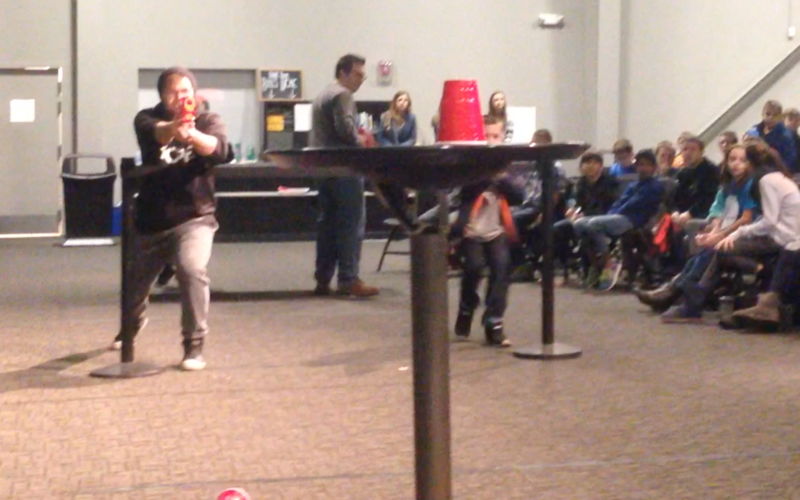 I don’t know who doesn’t like Nerf Guns, not to mention getting to shoot them in Church! 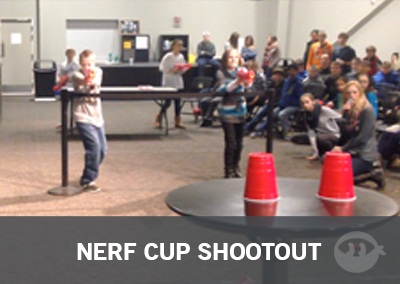 This is a classic shootout using a Nerf gun, and an obnoxious amount a solo cups, that explode when they get hit. This is a super fun game that your students are going to love! 1. Nerf Gun. The number of people you have playing will determine the amount of guns you will want to get. We had 4, and we paired our students with another student, or their leader, to work together in teams. This way there was a lot of action going on. The ones we used can be found HERE. 2. Solo Cups. We made a structure of 15 cups (the bottom row had 5), but you can get as crazy and as big as you want. You will need three tables (1 rectangular, 2 high tops). The rectangular tables goes behind the shooting line and is used as a reload station. 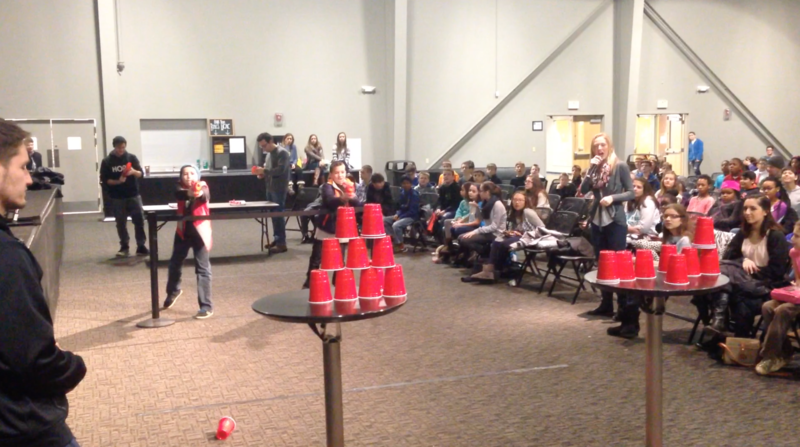 The two high top tables are where we set up the pyramid of solo cups. You don’t have to use to high top tables, but the cups need the ability to fall off something. Tape a line on the ground where you have to shoot behind. To win you must knock all the cups completely off the table. We used teams of two but you could play 1v1 if you wanted to. The guns we used held 3 darts at a time but we only allowed them to load one dart at a time. The players start with an empty gun. They must load one bullet into the gun at the reload station and run to the shooting line. Each team can only have one person at the shooting line at all times (#gunsafety). 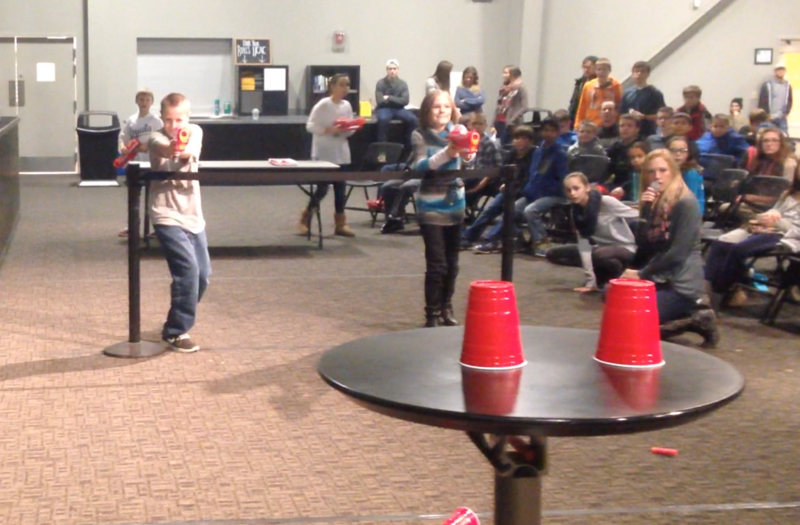 After one team knocks all the cups off the table, they have won the game!